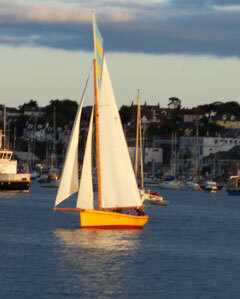 A pleasant NW wind with fair weather cumulus set the day and with the wind in the Carrick Roads veering to North the race officer Geoff Davis anchored the committee boat over on the eastern shore near the water tower. Fifty one boats came out to enjoy the racing. A long start line was set by Mike the RIB and five M class Firebirds started with one trying a port flyer but being forced onto starboard by the rest of his fleet. Eleven Q class spread themselves along the line in an orderly fashion. Neil Chamberlain, singled handed in Tai Mo Shan, had the best start by the committee boat with Chris Bell in Hawk just to leeward. North Bank to port was the windward mark and the fleet split as they found the various wind shifts. Ten U class yachts then started 5 minutes later the majority standing on starboard tack with more breeze and the last of the flood tide carrying them up to North Bank. 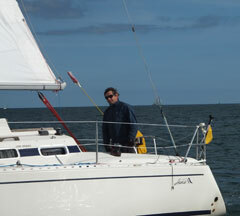 Popincoota, Alan Grose went left and managed to pass two boat lengths ahead of Trifle, Chris Jelliss on the first tack. Popincoota increased her lead by several boat lengths at the windward mark. 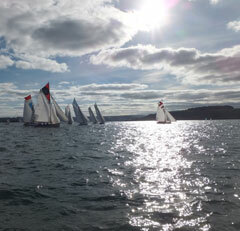 Eight Sunbeams started and as usual there was close racing between them. Five W class yachts set off on their course and had the advantage of seeing the previous fleets ahead indicating the wind pressure and shifts. Eight B class working boats then brought up the rear and set off with their topsails painting the scene a colourful palette. Meanwhile back at the club three G class Gaffers went backwards up the river towards Penryn in one of their traditional novelty events. Ultra Violet, Peter Stephens beat Mike Webb, Crackerjack in the multihulls. Mel Sharpe in Demolition managed a spectacular spinnaker wrap on the first run back from North Bank, which did not help his final position in Q fleet. We hope he sorts it out before the Half Ton Cup! Per Elisa, Robbie Tregear beat Temeraire, Martin Eddy by an incredible 14 minutes on elapsed time and 8 minutes when corrected. Popincoota held her lead all the way and on the last leg from St Just to the finish was almost overtaken by Trifle who set a shy spinnaker. Disting, Paul Whitehead overhauled Trifle and was 2nd over the finish. However Aurora, Mandy Owens 4 minutes behind won on corrected time with Trifle coming 2nd. Saucy Sally, John Lowry beat Ivy, Nigel Glanville in the Sunbeams and Len Trenoweth, Gap Year beat Amneris, Mike Robson in W class. Victory, David Carne beat Winne, Arthur Williams in the working boats with the others being scored DNF as they decided to sail a different course! There are plenty of sailing instruction books in the clubhouse guys!! Thanks to our sponsors Hine Downing, the Race Officer and crew of the committee boat. Jeannette and Lynn on the ops room and Sue Clark for the results.